I love moist cakes, but I hate the word moist. It's a bit of a dilemma, right? I've tried using a million other words but it just doesn't work. I mean, really, I doubt you'd be interested in trying this cake if I said "hey guys! I just made this delicious damp cake" - totally not working, is it? Nevertheless, this cake is absolutely positively scrumptious. It's a little bit messy and a little bit crumbly, but trust me - you won't care about that whatsoever once you take a bite. 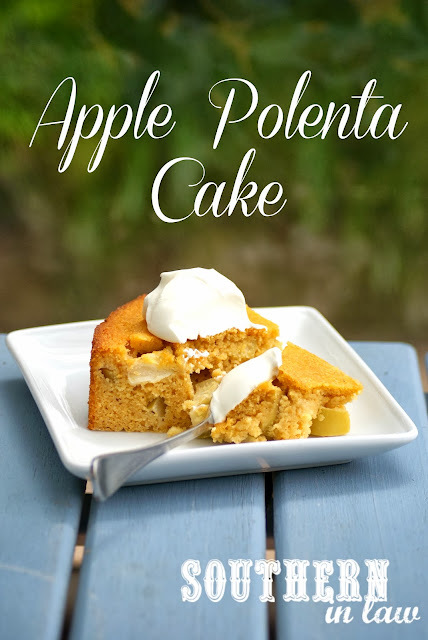 It has a delicious texture thanks to the polenta with a buttery vanilla flavour and juicy bites of apple - you totally cannot guess that it's a healthy cake! This beauty is perfect for afternoon tea with friends, dessert after a scrumptious dinner or enjoyed as a snack - heck, I won't blink an eye if you eat it for breakfast! I love fruity cakes and this Apple Polenta Cake is quite possibly the ultimate fruity and impressive cake. It looks gorgeous with its golden yellow colour and chunks of apple peaking through the top. We served it up for friends with a simple dollop of yogurt but you can also use creme fraiche or mascarpone or whatever you fancy - but it is also delicious eaten on its own! So let me give you that recipe! Pre-heat the oven to 180°c 355°F and line an 8" cake pan with baking paper. Cream together the butter and the sugar until light and fluffy, add in your eggs, vanilla and applesauce and mix until combined. Add in your polenta, flour, baking powder and salt and mix until just combined. Mix through your chopped apples until incorporated. Scrape your batter into the prepared cake pan and place in the oven. Bake for 35-40 minutes until a skewer inserted removes with only a few crumbs. If the cake browns too much, place a piece of tin foil over the top half way through baking. Remove from the oven and allow to cool before removing from the pan. 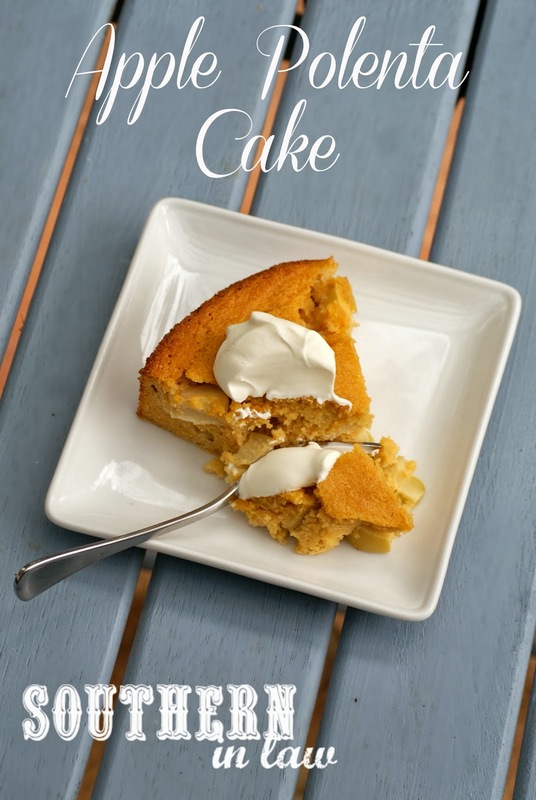 *when making a gluten free version, I like to use self raising flour for a light and delicious cake. When using wheat flours, just use plain flour! But tell me, if you're having afternoon tea with friends - what's your go to treat? 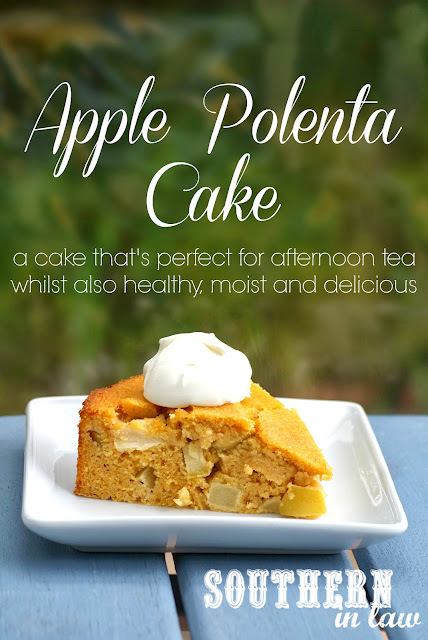 Funnily enough it's often apple or blueberry cakes for us - it's something about a moist and fruity cake that goes perfectly with afternoon teas! Also, what's the one word you can't stand? I am so sorry you've had such a bad reaction to your ironfusion, Kristy! Hopefully by now you've started feeling bette. You poor thing!! This cake looks divine. I actually don't believe I've ever eaten or worked with Polenta before. I'll have to see if our local grocery store has any. It makes the cake super moist and delicious so it's definitely worth a try!